Discover the latest Indemne novelty with ultra-gourmet perfume and hippie chic look for the well-being and comfort of all skins and spirit by olfactotherapy! We are in a whole new era, that of an innovative concept that can pride itself on having at heart the serenity of our spirit thanks to the sweet fragrance of almond tree that it releases. It was obtained through a selection of ten essential oils such as Camomile, Sandalwood or almond that help fight against anxiety and strengthens self-confidence: the very first anti cosmetic -stress. His fragrance does not leave us indifferent and takes us to our little Madeleine Proust to each of us. BABA COOL also offers benefits for the body: nourishes, softens, sublimates, perfumes, reduces emerging stretch marks, strengthens the skin thanks to Avocado, Grape Seed, Macadamia or Sweet Almond oils, rich in Vitamin E, Omega 3 and 6 and Antioxidant. The adventure begins now, discover our brand new concept. 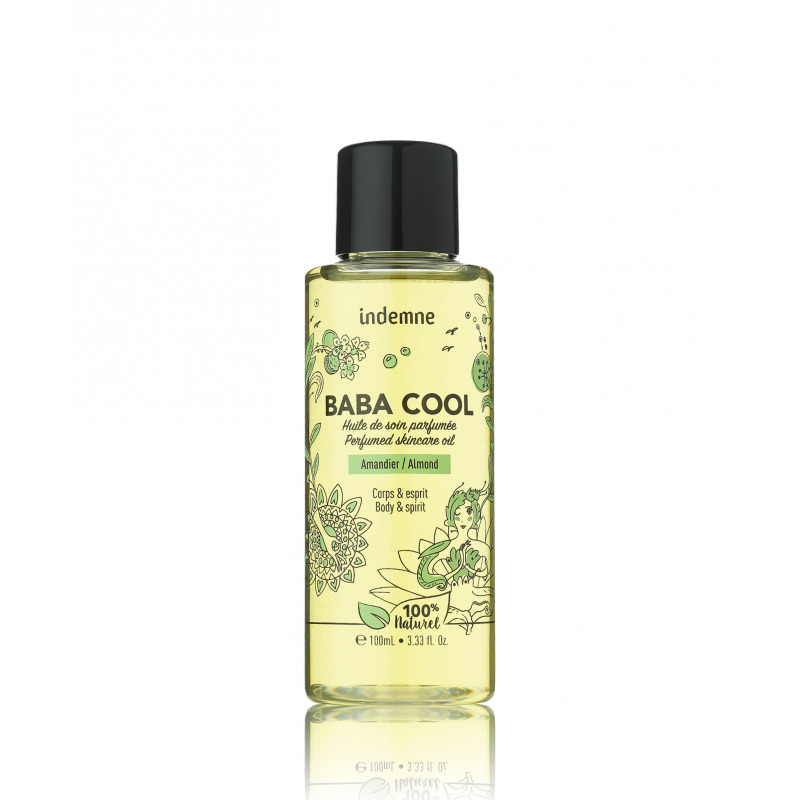 An avant-garde and revolutionary care oil for the well-being and comfort of the body and the spirit of the whole family in a hippie chic universe! This zen oil, with the perfume 100% natural and ultra greedy of Vanilla-Coco, it is your escape in the tropics in bottle! " Grape seed oil, sunflower oil, vegetable fatty ester, Macadamia oil, vegetable fatty esters, sweet almond oil, Avocado oil, perfume *, aromatic compounds found in the natural fragrance.